Catch was released a little over a week ago, and some of my photography was published!! If anyone is interested in a copy, just holla atchur girl. Saturday was the Hillel Club Bagel Brunch, which was a total success, seeing as we ran out of bagels and everyone loved the event. The party at The Spaceship Saturday night was really something else, involving all sorts of music, dance, basements and attics. I stayed out all night long and it took days for my ears to stop ringing, but it was really one of the most beautiful nights despite the cold. I finished my main study abroad application essay, and if all goes to plan, I'll be in Florence next fall studying art history and literature with a host family. 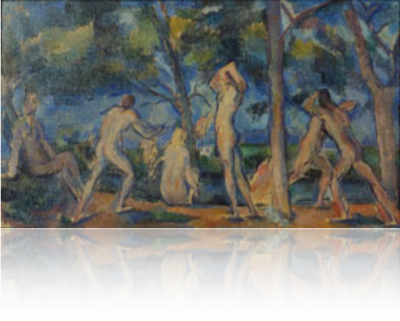 Speaking of art history, I spent three hours Tuesday in the library doing research for my term paper topic (kind of a big deal) and I picked a topic that I sort of fell in love with; Gender and Sexuality in Cezanne's Late Bathers, totally psyched out for this. I had a literally awful Atmosphere and Weather exam yesterday, and I kind of need to step up my game in that class, because I love the subject matter, but I'm just having a difficult time. I just want to study storms already. Hillel Club/Making Things had a really great event last night making Chagall inspired stained glass windows, and we had a really great turnout again, plus the windows look gorgeous and we're displaying them at I-Fair this weekend at the Israel/Palestine booth. Ben, Erica, and I were interviewed by The Register Mail, the local paper in town as well as the school newspaper, TKS. The big big news is that last night I pledged my school's chapter of Kappa, and I'm really happy with my decision. The girls are absolutely amazing, and it was a complete honor to be asked to join the sorority. Plus, we pledged at Stewart house where Kappa was founded 137 years ago. The whole experience has been really surreal but I'm excited to see where all of this takes me! This is Aly and I after plegding. 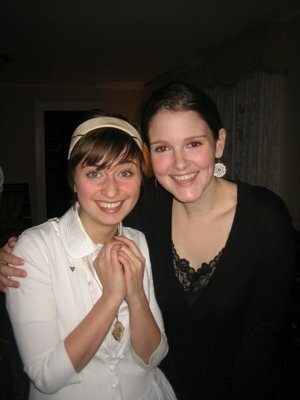 Paloma was my pledge sister yesterday, which was really amazing since we grew up together. What else? Tonight I had my Knox Blogger meeting, and I'll be putting up a link to my Knox blog shortly. The meeting was fun and they gave me brand new Canon digital camera for shooting my life, funny right? I start blogging sometime this week. Also, my radio shows start next week. I have my Pre-teen Angst show with Zac on Monday nights at 8, it's basically anything you loved in 7th and 8th grade (lot's of Sum41 and Blink and even some Wheatus "Teenage Dirtbag"). And then Tuesday night at 6 is my regular show Roy G. Biv, and I'm hoping to host a strictly 90's themed show this term. The link for the WVKC website is http://deptorg.knox.edu/wvkc/ and you should all try to listen. I give lots of shout outs. I'm really excited for my Mom and Mari to come visit me next Wednesday night. And can you believe how Project Runway has been turning out?? First Kevin, then Kit? And then BAM, Ricky wins? Weird. OK homework time. Let's read about Michelangelo and da Vinci.